If you’d like to remodel a bathroom, do not, whatever you do, start ripping out tile first! Many a homeowner or remodeler has looked at the smallest room in their house, thought to themselves “Hey, it can’t be that hard,” and dived right in—only to get themselves in a tubful of trouble. This one probably needs no explanation, but let’s talk about money. If you want to simply paint and spruce up your bathroom, maybe add some curtains on a long-neglected window, then you can probably skip this step. But if you want to do anything more complex or costly, I highly recommend you first determine what you’re willing to spend before you take any other step. 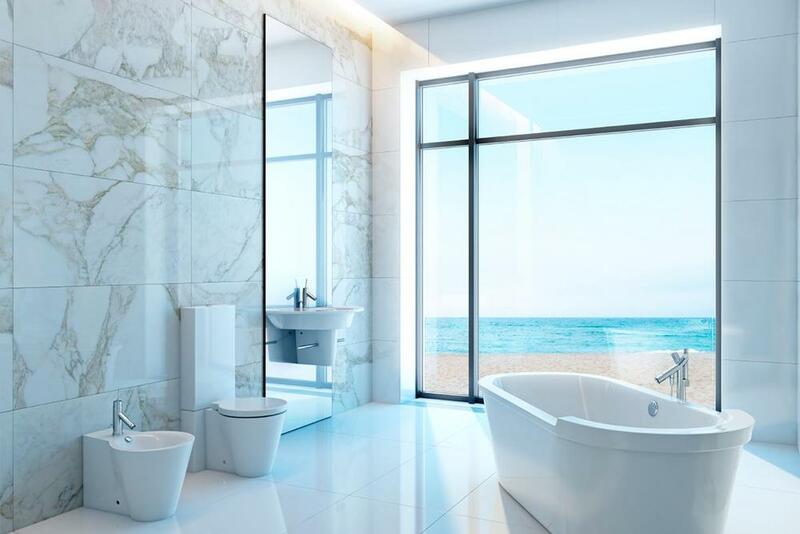 Bathroom renovations can be quite expensive—in some cases, even more than a kitchen—so you’ll want to establish some absolute financial parameters before you do anything else. Ask yourself: What can I afford to spend on this bathroom? 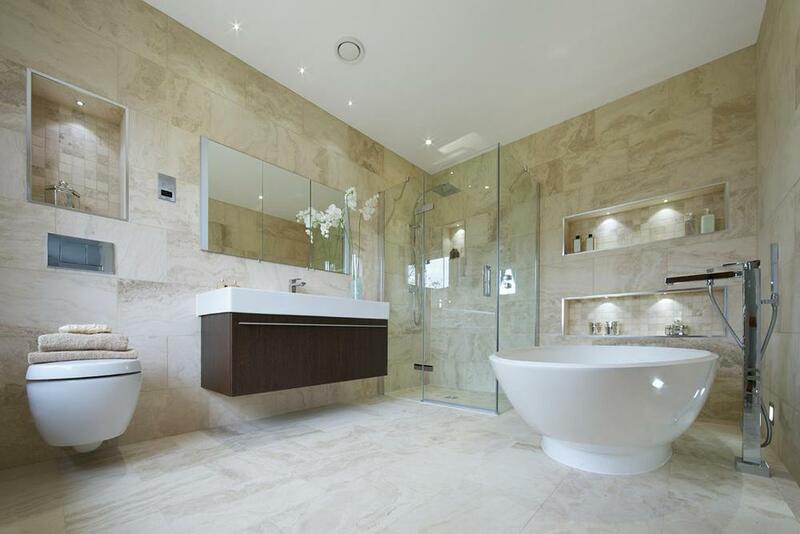 How big a deal will this bathroom renovation be for you and your family? Do you have other bathrooms you can use while this one is torn apart? Try to determine, after you’ve calculated your budget, how long you can afford to do without this particular bathroom. Enlist some professional help at this point if your renovation requires it—or even if you think it doesn’t. Check with neighbors or friends who’ve been through it, and ask them what their experience was like. Call a couple of trusted contractors and have them give you a professional estimate, which they will generally provide free of charge. At the end of this step, you’ll have a better understanding of what you’re about to undertake, and how long it will require to meet your goals. 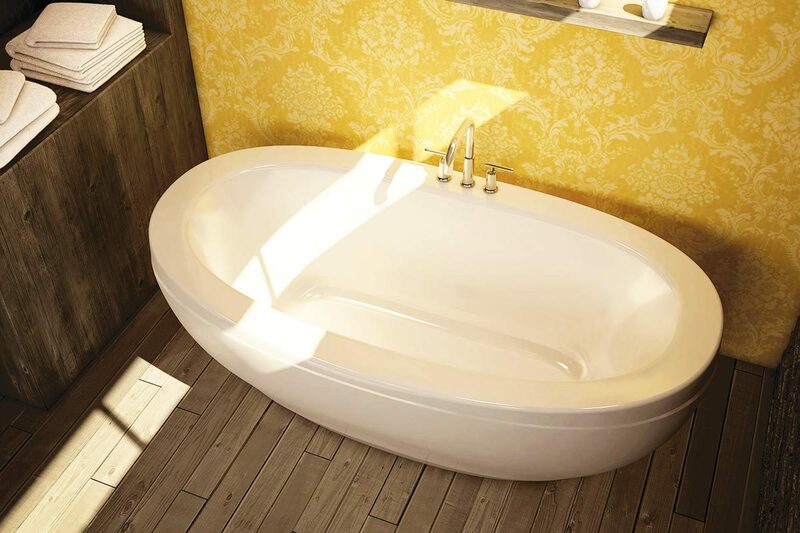 Many local regulations require building permits for bathroom renovations. Some areas, especially jurisdictions without city sewer systems that rely on septic tanks and leach fields, ask homeowners who renovate or add bathrooms to add sewage capacity, as well. Newer building codes require things such as water-saving plumbing fixtures or extra ventilation capacity to guard against mold and mildew in wet bathroom environments. Before you start, make sure you understand the local requirements. Licensed contractors with experience can easily explain what’s required, which is one of the reasons why a bathroom renovation can always benefit from the advice of a good contracting professional. The last time I remodeled a bathroom I got a big, expensive surprise: an improperly sealed shower drain had, over time, allowed the wooden subfloor and the structural framing underneath to get wet and rot. That hidden problem added a considerable amount of unanticipated time and expense to the job. With bathroom remodels, my contractor friends tell me, this is a common occurrence. Water can cause all kinds of difficulties—from plumbing leaks to unsealed tile grout to mold and mildew. Every bathroom renovation budget requires some padding as a result. A general rule of thumb? I always try to add a third of the estimated budget, and anticipate finding some hidden problem once the renovation begins. If that doesn’t happen, terrific—you’ve saved a large part of your budget. That is a much better outcome than getting deep into a bathroom remodel and discovering you can’t afford to finish. Many people skip this step, amazingly enough. They just want to modernize or upgrade their bathroom, so they see fixtures they like, buy them, and try to make them fit into their bathroom’s footprint. This is a serious mistake. Instead, think beforehand about the overall style of your home; about the kind of bathroom you’d most enjoy; about the kinds of surfaces you want; and most importantly, about who will use this bathroom. Is it primarily for guests, for kids, for a couple? That substance question has enormous implications for the renovation. You plan on keeping your home forever, right? The average homeowner moves every five years, so that may not happen, despite your best-laid plans. So when you’re planning your renovation, think if you can about how it would look to a potential buyer at some point. For example: if your family likes showers rather than baths, don’t make the mistake of tossing all the tubs—a future owner might want or need one. With large families, multiple people often want to use the bathroom at the same time, so you might want to think about separating the toilet and shower from the sink area. Walls, flooring and countertops have an enormous impact on not only the visual appeal of a bathroom, but on its usability. 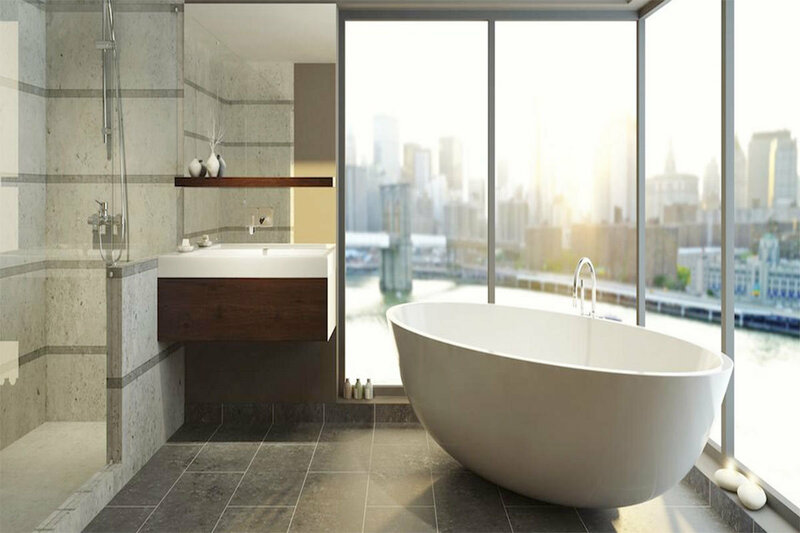 Conventional waterproof bathroom surfaces like ceramic, marble and granite appear so often because they’re durable and appealing to most people; but recently other materials like natural or cultured stone, cork, sealed concrete, stainless steel, or the new generation of vinyl tiles (which look much better and last much longer than their old linoleum ancestors) have begun to appear in many renovations. One last note, and it’s a pet peeve of mine: whatever surface material you choose, make sure it’s slip-resistant. Marble or granite with a highly-polished finish looks great, but when wet they make a terrific basis for broken bones. 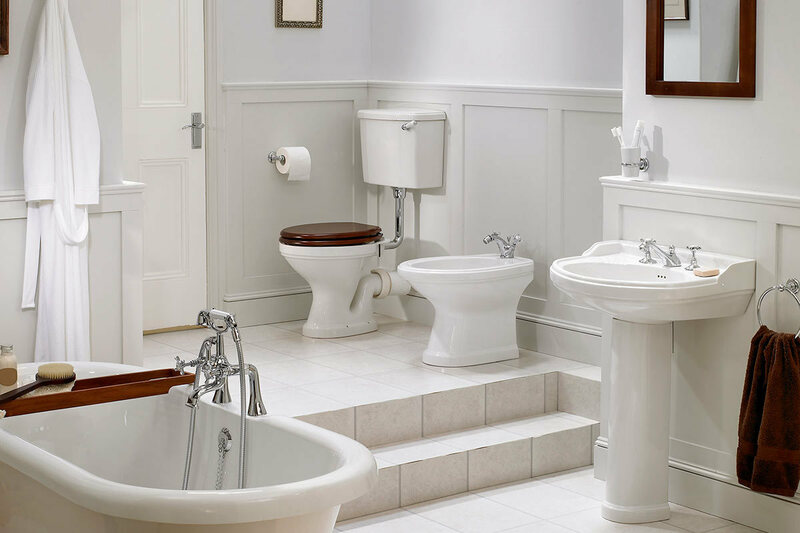 Whatever you choose, especially when it comes to commodes, sinks, shower enclosures or tubs, and hardware like faucets and knobs, don’t scrimp at this stage. You can install inexpensive home-improvement store fixtures and wind up with an unappealing, generic bathroom; or you can spend just a little more and match your more original and interesting fixtures to the style of the home. Remember, too, that bathrooms are the most-cleaned rooms in the house, so choosing easy-to-clean fixtures will save you time and effort. I love good light. As a result, I’ve made lighting design one of my big interests, which means I try to keep up with what’s available and what looks best. Bathroom renovators can take advantage of the many great lighting options that exist today, especially in the energy-saving lines that most manufacturers now offer. Also, if you can, find a way to admit some natural daylight into your bathroom, with skylights or solar tubes—that will save you energy, and give you a better sense of what you really look like in the mirror. Got all your boxes checked? Good luck with your new bathroom!